I am a Yorkshire based artist interested in exploring the connections between historic and contemporary cultures. My practice is frequently social, encouraging other people to contribute to the creative process by sharing their stories as well as actively making art themselves. Working mainly with collagraph printmaking techniques in both 2d and 3d, finished pieces have colourful tactile surfaces and often incorporate words. From my studio near York I run courses for adults in a range of experimental printmaking techniques, encouraging confident exploration of individual approaches and styles. I also run community projects, where practical creative activities become a focus for conversations and developing new ideas. 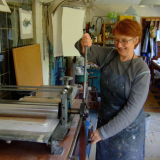 Here is a short film of me in the studio inking up and printing a collagraph plate.